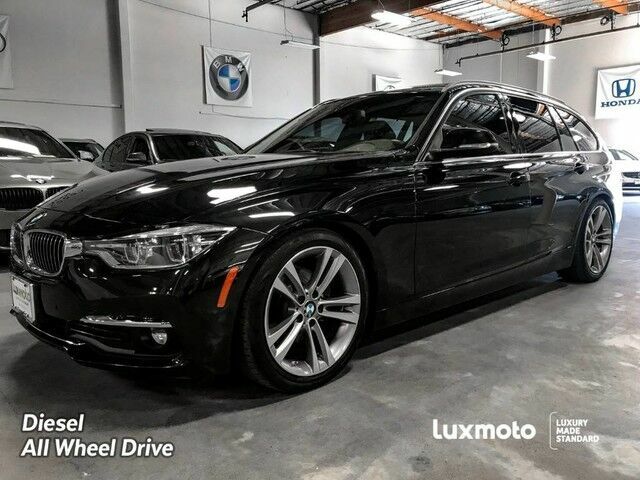 **CARFAX 2-OWNERS**, **FACTORY WARRANTY**, **CLEAN CARFAX**, BMW 328d Sport Wagen, **xDrive ALL WHEEL DRIVE**, **SPORT PACKAGE**, **PREMIUM PACKAGE**, **NAVIGATION**, **BACK UP CAMERA**, **HEATED FRONT & REAR SEATS**, **PANORAMIC SUN ROOF**, **HEATED STEERING WHEEL**, **ENHANCED BLUETOOTH**, **SMARTPHONE INTEGRATION**, **SATELLITE RADIO**, **MUSIC STREAMING**, **USB & AUX PORTS**, Front and Rear Proximity Parking Sensors, BMW Professional Audio System with AM/FM/HD/SirrusXM/CD/MP3/DVD Stereo, Comfort Access Keyless Entry and Keyless Sart, Dual-Zone Automatic Climate Control, Multi-Contour Sport Bucket Seats with Silver Highlights, Tilt/Telescopic Sport Steering Wheel with Paddle Shift, LED Dynamic Headlights with LED Daytime Running Lights, Fog Lamps and much more. Come take a closer look at this Exciting Wagon in our Indoor Showroom. The BMW 3-Series is a family of sporty sedans and wagons sized at what would be considered a compact car in the U.S. The 2016 BMW 3-Series Sedans and Sports Wagon models are built on a platform that made its debut with the 2012 model. Across its entire lineup, the 3-Series models stand out for being athletic, responsive and fun to drive, as well as more fuel-efficient than most other alternatives. The F30 redesign brought more back-seat space and cargo space to sedans, as well as a more sophisticated and isolated ride. M3 models, meanwhile, continue to be one of the most practical high-performance cars on the market. Interesting features of this model are long list of appearance packages and trims, athletic driving feel, high-tech options, A wide variety of options, fuel efficiency, practicality and comfort, and compact size and maneuverability.